When we think of mission and ministry, we often think of traveling to Ghana, Kenya, Mexico, or some far flung foreign country. The Church needs international missions, even the Apostle Paul cared for the new Christian communities in far away Rome, but he also cared for the Christian communities in Jerusalem which was much closer for him. For us today things are not much different. There is plenty of ministry and missionary work right here in the Diocese of the South. From Sunday, July 12 through Saturday, July 18, seven parishioners from the Nativity of the Holy Virgin Orthodox Church in Charlotte, NC made the one and a half hour trip south to Holy Apostles Orthodox Church in Columbia, SC. 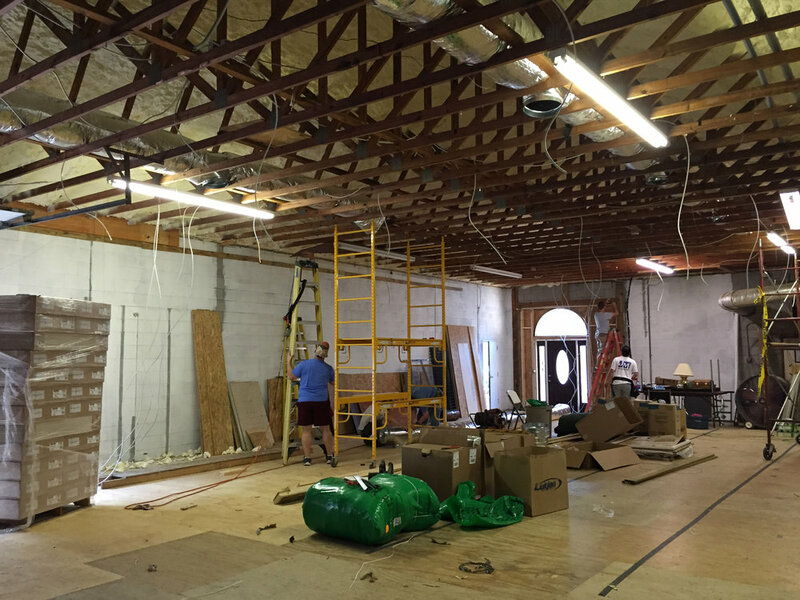 Our main task was to renovate their parish hall that was once a warehouse for the Swisher Company. According to Father Thomas Moore, their pastor, “The hall is used all the time. We have regular Alcoholics Anonymous meetings, Narcotics Anonymous meetings, and a group of Irish dancers who practice there. We plan to use the space for our Coffee Fellowship, but it needed a facelift.” The building got more than a facelift, it got a complete overhaul. In addition to the new duct work, our team also installed a drop ceiling, framed in a kitchen area with walls and a doorway, did a lot of rewiring, and put in a long granite countertop, installed two sets of double doors, and a new covered walkway that connected the sanctuary with the hall. All this was done under the direct supervision of Sam Salloum, a professional contractor and long-time member of Nativity. The rest of us were of all different career backgrounds and just did as the boss instructed. 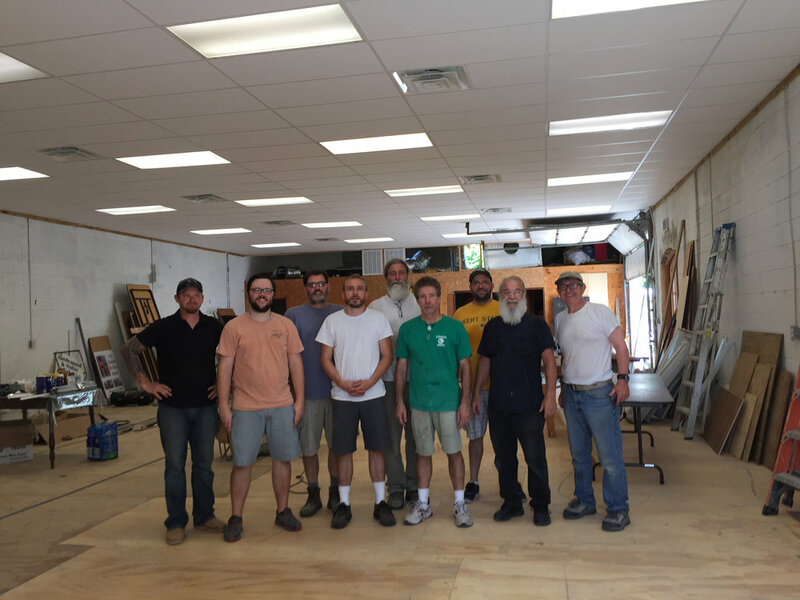 The idea for the Construction Ministry was born two years ago when Nativity’s St. Raphael Prayer Group got together and made an intentional decision to take on this type of ministry. A very generous grant – only for outreach projects – from a Nativity parishioner allowed us to move forward. The basic concept was to be that our parish would provide labor and all travel costs, while the host parish would provide all the supplies, housing and meals on site. Another condition is that whatever job we undertake has to be completed within six days. We do not want to leave the host parish with a job half done. Our first trip was to St. Nicholas Orthodox Church in Kenosha, WI where we designed and built a one hundred foot handicap ramp for the parish. This past summer, our trip to Holy Apostles was so close to Charlotte that our total parish cost was less than two hundred dollars. Holy Apostles provided our team a place to sleep and plenty of delicious meals. One could see many visible results from our labors; a nice ceiling, beautiful wooden doors, a new kitchen area and a covered walkway. However, there are many more invisible, yet essential aspects to this type of ministry: the fellowship among our team, the working together with parishioners from Holy Apostles and a couple of men from St. Timothy OCA Mission in Toccoa, GA, just three hours away, and the benefit of knowing that we helped make something that seemed impossible, possible. Our team is already excited about next summer’s project – to travel to St. Timothy’s Mission that would like a porch type entrance to their church and would also like us to build them a cupola. Father William Mills is the pastor of the Nativity of the Holy Virgin Orthodox Church in Charlotte, NC.